The Global Positioning System 2R-12 satellite, built by Lockheed Martin, will replace an older craft in the U.S. military's navigation network. Finally winning the battle over Florida's summertime weather after three earlier losses, a Boeing Delta 2 rocket roared to space Wednesday and deployed a Global Positioning System military navigation satellite in a mission dedicated to the memory of President Ronald Reagan. Dismal weather conditions at Cape Canaveral thwarted countdowns on Saturday, Sunday and Monday. After taking Tuesday off, the launch team geared up for a fourth attempt Wednesday despite a bleak forecast. But by mid-day optimism began to build, as the daily afternoon thunderstorms experienced earlier in the week weren't as widespread. With two hours left before launch time, the Mother Nature gave definite signs she would cooperate. The rocket was fueled up and put through final testing while the launch countdown progressed smoothly at launch pad 17B. 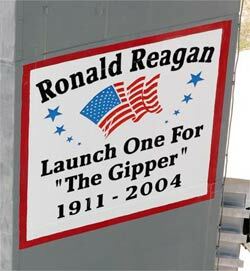 The pad's umbilical tower featured a sign reading "Launch One For 'The Gipper'" in remembrance of President Reagan. The 40th president of the United States passed away June 5. With the weather declared "go," it was time to fly. At T-minus 2 seconds, a Boeing technician pushed the button to ignite the rocket's main engine. Six solid rocket boosters mounted to the first stage lit when clocks reached zero, enveloping the pad within a vast cloud of smoke and steam. Lifting off at 6:54 p.m. EDT (2254 GMT), the Delta 2 rocket quickly darted into clear skies. Topped with the GPS 2R-12 spacecraft, the three-stage rocket took a southeasterly track above the Atlantic Ocean to deliver the $45 million satellite cargo into the proper orbit stretching from 11,000 miles at its highest point to 101 miles at its lowest and inclined 39 degrees to the equator. The 4,500-pound satellite was deployed from the Delta third stage 25 minutes after liftoff while flying high above the Central Atlantic. A kick motor attached to the satellite will be used later to circularize the orbit at 11,000 miles and raise the inclination to 55 degrees so the satellite can fly over more of the planet's surface. Once controllers check out the Lockheed Martin-built craft, it will join the GPS constellation and replace an ailing satellite. The GPS network features 24 primary satellites separated into six orbital planes with four spacecraft in each. The system currently has four backup satellites for a total of 28 craft working to provide U.S. military forces around the world with precision navigation information that helps guide aircraft, ships, troops and even bombs. Controllers will maneuver the GPS 2R-12 satellite into the Plane F, Slot 4 position of the constellation. That slot is currently held by the GPS 2A-16 satellite, which was launched on November 22, 1992 and has long surpassed its design life. Air Force program officials say GPS 2A-16 "is aging and clock performance is degrading." GPS 2A-16 is expected to be repositioned in the same orbital plane, making it a backup satellite for the remainder of its life, officials said. 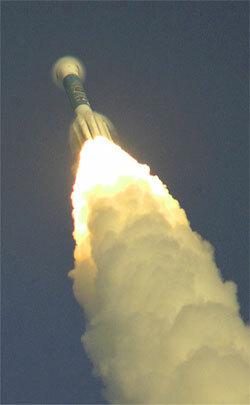 Wednesday's launch was the 51st GPS satellite to launch and the 40th carried on a Delta 2 rocket. It marked the second of three routine GPS replacement missions scheduled in 2004. The GPS 2R-11 craft was successfully deployed into orbit on March 20, and the next mission is slated for liftoff from Cape Canaveral on September 22. For Boeing's workhorse Delta 2 fleet, Wednesday's flight was the 111th successful launch out of 113 since 1989 and extended to 58 the string of consecutive successes dating back to 1997. 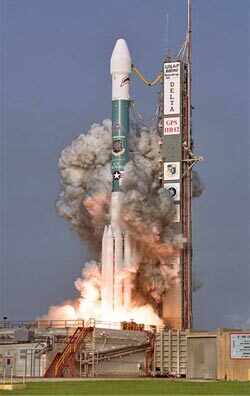 It was the third Delta 2 launch in 2004. The next Delta 2 flight will occur from Vandenberg Air Force Base in California no sooner than July 10 when NASA's Aura atmospheric research satellite is carried into polar orbit. Cape Canaveral's pad 17B will undergo a quick refurbishment over the next week so workers can begin erecting the stages of a Delta 2-Heavy rocket that will launch NASA's MESSENGER probe. MESSENGER has a 15-day launch window beginning July 30 that would send the spacecraft on its 7-year, looping trajectory to the solar system's innermost planet before becoming the first probe to orbit Mercury in March 2011. If the orbiter misses its planetary launch opportunity that closes August 13, the mission must wait until the next launch window in July 2005. NASA was anxious to see the GPS 2R-12 mission launched because it was impacting MESSENGER's pre-flight schedule. In addition to the weather problems that delayed the GPS launch the past few days, a series of technical issues had already postponed the liftoff since June 4. The slips have used up the slack in MESSENGER's schedule, leaving no time to spare in assembling its rocket on the pad. "We've been looking at the schedule. We're still capable of making the beginning of their window," Boeing mission director Rich Murphy said in an interview Tuesday.